In the previous generation, having an Xbox or PlayStation 2 in the trunk and little seven inch monitors in your headrests was the epitome of bling. But in today\'s fast paced culture, the console and the display are a given. The really pimpin\' vehicles need online multiplayer, which is what Omniwav Mobile is offering with their WavBoard EV1, a mobile broadband router that works on both Verizon and Sprint networks in the US. The WavBoard EV1 is a mobile broadband router, which means that it connects to the wireless broadband networks cellular phones use. The unit is small enough to fit in pretty much any vehicle, coming in at about the same size as the Xbox 360 power brick. Omniwav is selling versions for cars, trucks, boats and general \"portable\" use. The vehicle package goes for $979 and the marine package sells for $1,495. Monthly service fees range between $59-79 for unlimited use. 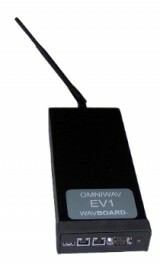 The WavBoard EV1 claims to deliver between 500-800 kbps connections and work while the vehicle is in motion. Those connection speeds are comparable to many home broadband connections, and could support online gaming via Xbox Live or other online networks. Coverage is currently available in 60 metro areas, and Omniwav plans to offer nationwide coverage in 2006.